Before reading (in summary) get a $5,000 bank loan that you can pay off in 3years and thats all you need for everything Im about to go over below. if you do everything i say below, youll sustain and get momentum in a 2-3 year goal. GL in your artwork. – Nine years ago, I decided that my passion for painting reached a point where I asked myself a simple question. Can I make money from this? Can I make a living doing this artistic pursuit? And I began to explore my options, and there were things I thought of, and one of them was teaching, which fortunately I get to do today. But, nobody knew who I was. I was a young artist just starting out, I hadn’t really experimented with social media too much. It really wasn’t big back at 1996. How was I going to get my name out? How was I going to actually make a living? Well, fortunately, especially here in the United States, we have an incredible network of art shows. Athens outside of Atlanta is one of my favorite plein air themed artshows I used to tour for passche airbrush paints — to demo using the paints. These shows allow anybody to submit an application and you can get juried in. If you’re one of those lucky people that are selected, you get to set up basically a portable gallery. You get to have a space, usually about 10 feet by 10 feet to display your work and have an audience come that is interesting in purchasing art. And there’s the relationship, and that’s how you begin. Now, I’m a airbrush painter mainly but this works for any creative artist that produces something, makes something, painters, anything 2D, 3D, ceramics, glassware, jewelry, photography you name it. If you’re creating something that you think is interesting and has value, there’s an opportunity to sell it at an art show. I think it’s important to define exactly, what is an art show? Many people the opportunity to possibly display some work at their local coffee shop, or just any kind of building where the public may have a chance to see it. This is a surprise. People go into a coffee shop, they’re looking for coffee, not art. An art show is the ability to put your work in front of people who are interested in purchasing art. Or at the very least, seeing that art. And our job, as artists, is (unfortunately) to try and get them to be able to purchase it as well — not just paint. So, it’s very important that you’re in a place that is very specific where people are coming to see your art. Now, art shows come in different levels. There are shows that are more arts and crafts focused, and what I mean by that is when you get into crafts, and smaller audiences perhaps, there’s less potential revenue. They may be easier to get into, and the shows go from there. And we get into these fine art shows, which are incredibly challenging to get into. Again, we’re going to talk about that jury process soon, and try and give you some tips there. But if you get into them, the audience has a lot of disposable income, they’re looking for fine art, and there’s a reputation to that show, where you have a chance to move a lot of pieces and potentially generate a lot of revenue. Now, it’s important to understand the art show is an industry as a whole, and I think I want to give you a little context here. In the nineties, there was a real economic boom in the art show world where the market was doing well. There was a lot of disposable income, and people in that world made a lot of money. And there were two things that happened. 2001, and 2008, we had economic downturns. My very first year doing art shows was about 2008 — waaaay after I used to tour as a demonstrator. And I had people that I met, and I asked them questions and tried to learn as much as I could from my peers. Not just still ife artists, but all artists. And they all said to me the same thing; you’re crazy. Why are you doing art shows now? Because for them, it was kind of the bottom. It was the worst year they had done in 20, 30 years of business. But for me starting out, I had perspective and it was this; this is my first year, I’m going to learn how to do it, and every year I’m going to get better. And that’s exactly what’s happened. Every single year from 2008, I’ve increased profits. And so it’s a learning process understanding where we’re at. Now today, the market is a little bit healthier currently, and so we’re seeing that the art show world’s a little bit stronger. So it’s important to understand that it is a market, and it goes up and down. We’re going to help define kind of where you want to be in that market. Maybe arts and crafts, or maybe more in the fine art spectrum. Now as we get into the art show world, there’s a couple things we want to consider. And specifically a booth and equipment. And we’re going to go into that. How to build a booth, what kind of booth you might be interested in, How do we transport that booth? So we’ll take a look at that, and how to get into art shows next. How do we find the art shows that you want to do? Well, let’s start with proximity. Where you live is so important because, you have opportunities to scout the shows. So, prepare, by spending a summer, or if you live in the south, maybe the winter, and go to your local shows and learn. And I’m going to talk about the kind of things you’re looking for. But, the first thing is: what happens at an art show? What kind of artists are there? What do their booths look like? So, those are just kind of, basics. Now, once you decide to apply for a show, if you decide to do a show local, it means less gas, no hotels. So. It’s very important to keep your costs down, especially as you’re learning. Do not expect your first year or two to be incredibly profitable. You will need upfront investment, and you’re working on recouping that before you get to profitability. In that process, you’re getting better and better at selling, displaying, really just kind of the whole system. You just get better every time you do it. So, think local. Now, the Internet’s been fantastic because the art show community is found online. They talk about the different shows. They’re reviewed. They’re announced and so there’s some great resources and I would like to share them with you now. The first one is called ArtFairCalendar.com. This one has been around for a long while. It’s a pretty simple website and as I go onto the homepage and scroll down, I notice that there’s regional descriptions, and I want to highlight one called West Coast Art Fairs. I live on the west coast, I live in the pacific northwest, so this is going to be for me, to start. Okay, so, as I come here, I see the month of August, which is the current month now, and the next show coming up. So as we go through here, we can see the major shows as they’re happening. So, it’s just that simple. These are the major shows on the coasts. Now, I’m looking at some shows in New York here. much else is a commute for me, if I live beyond Philadelphia. That means I’m going to take two days to get there. Think to plan for travel and Hotel costs. So, I might be looking for stuff closer to just NYC. Next hine in on dates you can travel and “waves” of what you can afford. So, we’re starting to think on a very local scale, and we have a whole list and ArtFairCalendar.com puts it in dates, which is a wonderful way to look at it. Now, they also have links to the actual sites. So, when you see a show you’re interested in you go to the website, and do research on that show. What kind of artists are in the show? Does my work look like it fits with the overall quality that I’m seeing? So, lots of information here. Now beyond ArtFairCalendar, it’s also tied to, what’s called, ArtFairInsiders, same company, and this is a forum. This is a place to discuss art shows and review art shows. And I went ahead and pulled up a review of a show called the Bellevue Festival of the Arts. Now, this is one of my favorite shows I’ve ever participated in, it’s a wonderful show. As I look through the information here, I’ve got the location, the dates, who presents it, when it was founded, it’s an outdoor show. Listen to this: 150,000 people expected attendance. That is a high volume show. That is a chance to put your work in front of a lot of people. There’s going to be 200 artists, gives you an idea of size and then you get when the application deadline is. When you’re starting art shows, you need to have calendar, and you need to have when to apply, when’s the deadline, and when they’re going to notify you when the show is. So, your calendar organization is key. Booth fee. The booth fee here, says between $720-$1660. What does that mean? Well, that’s very high in the industry. So, that typically means this is a high end show, and you can expect to do pretty well. The higher number relates to corner or booth size. So, most booth sizes start at 10 by 10. You can also get a 10 by 15, or even a 10 by 20, and you’ll pay more for that. You also, can put your booth on a corner, which gives you more access, more traffic. So, that’s the price difference, there. It’s got a link to the website so I can do research, and there’s a review, here. Now, I’m not going to read the whole review to loud but, I’d like to say that having read that review, I had a very similar experience, so its great that you can find out this information online. And so, maybe you live in California and you’re thinking about coming up to do the Festival of the Arts, but you can’t scout it ahead of time, you’re getting a wonderful review, here. So this is another great site for information. And finally, I want to point out a site called Zapplication.org. This site is about submitting applications to art shows. Now, we’re going to talk about that soon, but it also has a calendar section, and it breaks down when, it’s called Event Start, when you can apply, and then it also has an application deadline, when you need to get it in by. So, I love going through the calendar, what new art shows are coming up, what deadlines do I need to pay attention to to apply for. So, the internet has completely changed the way we discover art shows, now. These websites can really help you narrow down potential shows for your business. Applying for art shows is the first hurdle. The only way to get into a show is to make the effort and to put forth your best application possible. This should thought as part of building your portfolio i believe. I’m going to give you some tips and tricks to maximize your success. But I do want you to keep in mind that you are not being judged, necessarily, on the quality of your skill as a photographer, because, oftentimes, they’re looking for a certain type. So, they may be interested in black and white photography and you’re submitting color. So, you don’t want to take it personally when you get rejected, because, essentially, you have a room of jurors looking through your art that may or may not connect with what you’re doing, and they may be directed to be looking in a different direction. So, you’re going to get many, many rejection letters. That’s okay. It’s just like sales, you can get 19 no’s, but, man, you get that one yes. I find I get as little as 2% YES and no more than 20% YES seems very standard. So try to price one piece that can cover all your expenses for that event. So, the key is to maximize your application, which I’m going to tell you about right now. So, here we are in zapplication.org. Now, we talked about this in terms of looking at it as a calendar, knowing when deadlines are. And I see a deadline coming up for September 1st. It’s a show called the Desert Art Festival Thanksgiving Weekend. What’s really great is shows can be year-round. If you’re in an environment where the summers are beautiful, that’s typically where shows are going to be. What happens when the weather gets bad? Let’s say you get a lot of rainy weather, cold weather. There’s indoor shows, there’s holiday shows. If you want to do more outdoor shows and it’s February, you can go to Florida. So, there’s always shows going on. It’s an incredibly robust industry where shows, every weekend, if you want, you can be working. Now, as I pull this up, there’s some key information I want to pay attention to. The first is how many images they require, five. That’s very standard. There’s going to be four images of your work and one image of your booth. Now, let’s say this is your very first time ever applying to an art show. They have to see your booth and that’s standard. There’s not going to be an art show that’s going to let you enter without them seeing you know how to present your work in a clean, well-put-together space. So, what you have to do is you have to get your booth, put it together, front yard, in a park, somewhere, and you need to display your work and take really nice photos of your setup because they want nice booths that attract ticket sales too! You wish you could do that at your first show, but, to get into a show, you have to take a nice picture of that booth. The four pictures that you’re going to take are going to be a representation of what you’re going to sell. It’s very important that what you send in looks like what you’re actually going to be selling. So, they do check for that. Okay, the application fee, is like $20 (non-refundable). If you apply for a lot of shows, let’s say you just go, I want to apply for as many shows as I can to see what I can get into. That’s going to be very costly. Applications can be from anywhere from $20 to $50. So, if you think about it, if you do 100 shows at 40 to $50 each, that’s a problem. So, it’s very important to be selective here. Deadlines, when is this application due? When does the jury announce a winner? And so you really want to be conscious of these. You never want to be in a situation where you have a great show and you miss the deadline, so have a really strict calendar. This is key, take the time to read the jury procedure and the space and regulations, because, sometimes, as you read this, you’ll be disqualified. For example, there was a period when I was displaying canvas gallery wraps. They were selling really well. It was a really hot movement in the car wraps were booming. And there were some shows which did not allow it. But if you didn’t read the fine print here, you wouldn’t know that, so take the time, read the fine print. They’ll often say things like “the artist has to be there the entire time”, you would’ve had to have made the items yourself, you can’t import anything to sell. So, read those rules. I like to suggest to hire a local art expert person with silver hair in a blue suit and another “HOT/attractive” model with platinum blonde hair in a red dress to passout half page “handbill” flyers at the show. Design a space for a neon sticker so you can marker booth number on decals per event. Also make prints to sell for a portion of the costs of the original painting. Okay, so once you’ve gone through that and you decide this is the show for me, you can apply to the show. Now, we’re not going to go through the whole application process, because Zapplication has a very well-run website. They have something called the Help Center and if I go to the Help Center and select How to Apply, they have a video to follow along, so I definitely recommend watching that video. One thing I want to point out is Image Preparation. Over here, we see that. I’m going to say Read More and I look at a set of rules. The dimensions, the file format, the file size. Pay attention to these. If you don’t follow the rules exactly, they won’t accept your application. So, it’s a very strict thing, but they have excellent tutorials. And, in fact, if I click on this, I can actually watch a video of how those images are made. So, again, I’m not going to do that for you here, because there’s excellent resources online for you. Now, this is fascinating. You get to see what other artists submitted to the jury. This is a shortcut, this almost feels like cheating. But what the art show does is they want to advertise the artists that are going to be at the show. What do they advertise with? They pick one photo that they received as you applied to get into that show. So, here I am, I’m on a Art Festival website. this Art Festival is one of the top in the nation and I know the artists that were able to get in here are producing high quality pieces. I’m looking at jewelry right now and what you’re going to notice are these are stunning works, let alone the fact that the jewelry’s beautiful. The mirrored reflection, the gradients in the background. Somebody that does three-dimensional work, like jewelry, oftentimes will hire a professional photographer to take those images. You simply can’t take a snapshot of jewelry and get in an art show, it can’t be done. So, it’s very important that you get the highest quality images possible. If I scroll down to Paintings, what I’m going to notice is that, wow, this is pretty simple, they’re just painters. I’m lucky as a painter. I live in a world of two-dimensional space. So, photographers, painters, anybody in that 2D space, we just submit the images of paintings themselves. And so it’s very fortunate if you’re a 2D artist, but that’s essentially what you’re doing. So, you’re going to submit a group of photographs or photos of your paintings, scans, that kind of thing. So, it’s very important to have the highest quality images possible that you submit to the jury. Now, one last tip I want to give you is to have a theme. It’s very important that there’s a theme to your work. They’re looking at four pictures. Those four pictures need to tell a story, they need to be either, if you’re a black and white photographer, have that kind of uniform feel to them. I’ve seen great ideas, like seasonal. So, a color photographer will do a fall, winter, spring, summer. So, the more creative, cohesive, and original you are, the better chance you have of being accepted. Another thing to keep in mind is, if you’re doing something a little bit different, so take a look at these and say, you know what, I’d like to do something different, that is a good thing. Jurors like to see things that they don’t recognize. They go through so many applications, so the one way to stand out is to be original. Alright, so take a lot of time, look through different applications by going to the actual art show websites to see the images, and that’ll give you a great idea of what you need to produce. Using the websites that we’ve been exploring let’s try and find out which art shows are right for you. Now as a I look through Art Fair calendar, they have a list of the top 50 fairs in the nation. Now when I first started doing shows I said, oh man, I would love to participate in these. How cool would it be to go to a top show. And in reality I learned over the years, that it’s not necessarily about being in these shows, it’s about being in the right shows for you and the work that you do. But as I look through this list, I come to one local Im familiar with. Now this Art Show, we have pulled up over here, these are the painters that were able to get in this show this year, and what I want to do is take a look at the images that they submitted to the jury, and I get to see one image and is it representative of something that I do, is it part of my style? Is there something that I do similar to what they’re interested in displaying. Now as a I come here, I see there’s a landscape painter. There’s another landscape series. They like color. I’m looking right here at four color landscape painters. That’s primarily what I sell at artist shows. This is telling me that this art show could be right for me. What’s great about that is hey, it’s a top show, it’s a little bit intimidating at first. It can cost a fair amount of money to apply, but I know what they like. I know what they’re after. I know what’s been submitted and so I have the confidence to say, hey this is right for me. Let’s look at another show. This one’s called Art In the Pearl. This one takes place in Portland, Oregon. As I go through the photographers, I see something a little bit different from what I do. Now that’s a a style that the jurors of Portland are looking for. So I see some still life. I see black and white abstract. I see color manipulation. I’m seeing something a little bit different than what I do. They don’t have a photographer that does just color landscapes, and that’s okay, that’s their show. But what’s so important from my perspective is, hey this isn’t for me. I’m going to save my money and I’m going to look for a show that weekend that fits my style. Now as I’m on this site, I want to point out something really interesting, and really, really so informative. They’re actually showing me exactly what the jury saw. So if I come to the first picture in this set, I see a booth shot. This is it. This is a booth shot with the images hanging on the walls. And as is I go through the four images I can see what was submitted to the jury. This didn’t used to be available. We used to take a guess. I hope the jury likes these four images and we still have to take that leap of faith, but we get so much information. And I really want to encourage you to keep doin’ the research online. The fact that you’re watching this course is a great start and I’m hoping to give you the tools to continue to do research, because the more you look at these images, that were put in front of the jury, the more you’ll understand what makes sense for you to submit. Let’s look at one more show. We’re at the Edmonds Art Festival. Is this a local show for me? It’s a show that I’ve done before, and this has a lot of variety. There’s some cities. There’s black and white. There’s abstract, and there are a couple color landscape photographs. So this is telling me, hey, not only is it local which is something I love to do, local shows, but they have a color landscape in here. That means I have a chance. There’s a reason for me to apply. I can see what was accepted, and it’s a right fit for me. Now, of course, I would love for you to go to these shows in person and see the art on the walls as ideal, but you can’t always do that. We don’t have the time. Maybe the show’s too far away, so we have these incredible online resources to to find the right show for you. – I would love to share with you one more trick to help you find art shows. I often look for Pacific Northwest artists. What kind of shows are they doing? I know they probably want to do local shows like myself. What is interesting them? Especially photographers or artists that I know have been doing this for many years, because they’ve learned a lot. If they’re doing a show year after year, there’s probably a good reason. Here we have a Pacific Northwest photographer. If I go to the website and click on schedule, I get to see what’s going on for the year. This is wonderful information for me. Not only do I see some local shows, I see a show, for example, in St. Louis. You have to ask yourself, why go from the Pacific Northwest all the way to St. Louis? With a little more research you find out that that is one of the top shows in the States obviously worth the trip if you’re willing to make that journey. It’s great information to do a deep dive on different artists in your genre, see what shows they’re doing, because they’ve learned a lot of the lessons that hopefully you can avoid learning the hard way. Now, let’s say it’s our first year, we get out there, and we get into some shows. What you do at that show, your approach, we will talk about later, but at the end of the day you’re going to either say that was a good show or that was a bad show. Generally you either do well or you don’t. The important thing to take away is that there’s no bad shows in reality. It’s more of a lesson show. You go to a show and you say to yourself, “Wow, I didn’t do well. “Why didn’t I do well?” There’s a logical reason most of the time. When I first started I said, “I want to do every show I can in the Seattle area, “every show that’s near me,” because I love keeping my expenses down and going to local shows. Some worked and some didn’t. The ones that didn’t work, here are some of the things I learned. Some people came to the show for the food and the entertainment, not the art. Another lesson I learned, the foot traffic was so small that it didn’t matter whether people were buying or not. There just wasn’t enough consumers in the audience at that particular one. Everything is a learning experience. What I want you to do is test the market, learn from it, and move on from there. What I did every year is I said, “Okay, that shows got to go,” and I cut that off my list. Maybe I tried something new from information I gathered on the website or maybe talking to my peers. Over time my shows evolved. By about five years into it, I was only doing great shows. Every show I did I’d been at before or I had great information about it, and I knew more or less how I would do based on the experience. It’s going to be a little bit rough at first. Some shows will work, some won’t, but you have to streamline it and you have to look long-term and say, “My goal here is within three to five years “I want to find the right shows for me.” Have the patience, go out there and do some shows. We’re ready to do a show, but we need a booth. All right, let’s talk about what we can do here. It’s difficult to spend a lot of money on something, especially in a business you haven’t quite done yet, but if you have a booth that doesn’t hold up in weather, if it doesn’t look professional, that can affect your ability to get in a show, and it can affect your sales. So, let’s talk about the canopy to start. Most art shows are outdoors, and the art show themselves require you to have a canopy. So it needs to be a tent, and it needs to be sturdy. Now, if you’re doing a show in a place that gets extreme weather, sometimes the Midwest gets a lot of wind during art show season, the sturdier the tent, the more successful it is going to be at dealing with those elements. I’ve been in shows in the Pacific Northwest with heavy rain. You do not want a leaky roof. So, it’s important to consider investing into something that you know is going to last. There’s two companies that make canopies, tents with roofs on them, and walls, that are the most popular. The first one is called Light-Dome Canopies, and we’re looking at it here. We have two models, the Light-Dome and the Finale. Now, this is a system that… The Finale that I’ve had for years and years. It’s always worked. I’ve never had a problem with it. But it was expensive to purchase, and it takes a lot of effort to put together. So, there’s pluses and minuses. 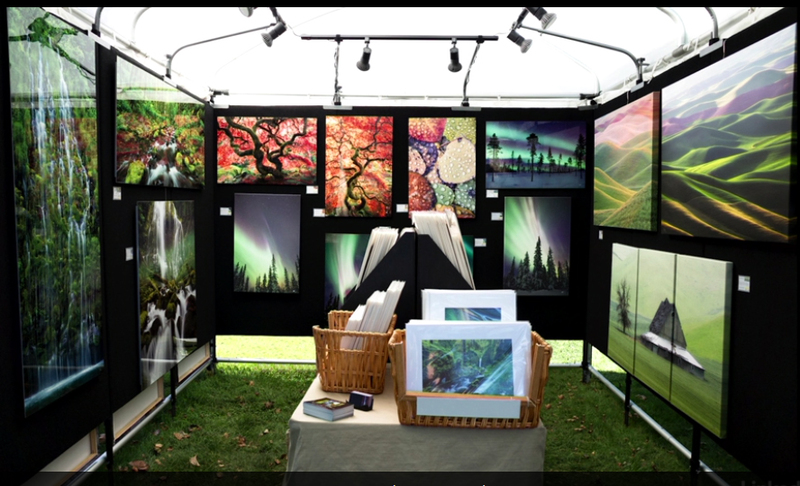 Now, when I first started doing art shows, I went with these display walls that you can get with the tent, and what they are is essentially mesh that you can roll up and then display really tight amongst the poles, and you can actually hang art. And we can see a picture of it here. Now, the reason that I did this, two-part. One, it was pretty affordable, reasonably so. And number two is I thought, “What if I could get my whole booth into my Subaru Outback “and a roof top carrier?” At my first year of shows, that’s all I had, and I would go around in my Subaru. And I remember meeting an artist that had been doing shows for 30 years, and he could not fathom how I fit it all into the Subaru. But the way I did it was these roll-up mesh walls. So, if you don’t have a lot of space to transport your booth, this is a great option. Eventually, I went to Pro Panels, which we’ll get to soon. The other company that I want you to consider is called Flourish. They make the Trimline Canopy. This is incredibly popular. They can go very tall, and hence you can use all that real estate to display art. And both these companies make really nice awnings, and awnings are wonderful ’cause they not only prevent rain from hitting the sides of your walls where you may have art, but they also shade it, so that you’re not getting harsh sun coming into your booth. So those two companies are the most common canopies that you’ll see as you’re out in the art show world. There’s one more thing I’d want you to consider. Now, some of you may be saying, “I’m just not ready to spend that much money” or, “I’d just like to test the waters. “I want to try a season of art shows, “see if it’s right for me, and then I’ll invest more money.” Well, I’d recommend something like this. It’s called the King Canopy. It’s from Amazon, and this is a 10 by 15. This is a very large canopy, and it retails for about $270, which is a fraction of the cost of the other canopies, and to actually put it up, you basically get four people and you just walk it apart and it pops right out. It’s not going to do well in harsh weather, but if you have a beautiful, sunny day, the tent works fine. I actually purchased this, and I’ve been using it because I upgraded the size of my booth. My other canopy is only a 10 by 10 and I needed a 10 by 15, and I didn’t want to spend a lot of money. So I thought, “Why not? I will try this.” It’s actually worked well. I haven’t been in harsh weather, thankfully. So there are affordable options out there. Remember, once you get this, you also need the walls, so I’m going to click on the walls here. Most canopies come with them, but make sure you get walls. The reason we need these is for security. At the end of the night, most shows are two to three days, we need to put all of the walls down and secure the booth. So you need the canopy and the walls to go along with it. All right, let’s get inside the booth. I mentioned the mesh walls. That’s an excellent option, especially if you’re starting out. But the industry standard, the most professional looking walls are called Pro Panels. Pro Panels are basically almost like a carpet along a pretty thick wall, and you can kind of mix and match these 30 inch panels any way that you want. And when you go to their website, it’s an excellent website, you can see different pictures of the way that they’ve kind of created spaces. When I first started investing in Pro Panels, I came and I just dove into this site, and I wouldn’t stop looking at different options. They also sell some things on Pro Panels that match your walls. Let’s say that I picked black. You can get bins to hold prints. You can get a desk. You need to sit at a desk. So there’s different things that you can get that kind of go together. What I really want you to do is go to a local art show, see some booths that you like, and don’t be afraid to ask the artist, “Hey, what kind of booth is this?” Take a look at what’s in their booth. You’ll see a desk, or a chair, business cards, guest book, all these different things. Write ’em down, take notes, see what makes their booths successful, because those are the kind of things you’re going to need, okay? So Pro Panels are excellent. They are not cheap. It’s one of those things that if you really want to commit to art shows, or maybe you do it for a year or two and you’re ready to jump in. It is the industry standard, they are a fantastic product. Okay now, how do we get this booth from point A to point B? So again, I told you my Subaru story. As soon as I got Pro Panels, that was never going to happen. So I had to upgrade, and many people have a large van. You can get something like a Ford Transit or Dodge ProMaster and they make these very large cargo vans. I did not want to spend a lot of money on a vehicle. This was something that didn’t interest me. I don’t have a place to store it, insuring another vehicle, all those things didn’t interest me. A lot of people go that route, but let me show you something a little bit easier. For me, at least, was getting a trailer. A five by eight trailer is large enough to fit a full 10 by 15 Pro Panel booth and everything you could need. It really is spacious. They’re relatively affordable. You can get one used for less than a thousand dollars. You can get a brand new one for around $2000. They’re very affordable. And my Subaru Outback was powerful enough to pull it. So there are some affordable options. Again, I do recommend kind of stepping into the art show word, seeing if it’s right for you. Just getting your foot wet. So this is an excellent, affordable option for that. All right, so we’ve got the canopy, we’ve got the Pro Panels, the walls, and we’ve got a way to transport it from point A to point B.
I’d like to take you through a booth and talk about what I think makes it successful. Now I think it’s only fair we use my booth. I don’t want to critique somebody else’s without their permission so let’s dive into my booth. I can tell you creatively the choices I made. Logistically the things that I decided to do. So we’re looking at a booth that was displayed about two years ago. We’ll notice that it’s on grass and a lot of times you’re going to be in a park, and so that’s something to consider. So I’m on grass and I’ve got a 10 by 10, so it’s 10 feet by 10 feet, very strict amount of space. It’s not very big and it’s something to consider, you have a limited amount. So I want to display every photograph that I have that I know has ability to sell. All my best sellers but you don’t get to do that. You get to be incredibly selective,. Now on the back wall and the left wall, we seen metal prints. Large metal prints especially on the left wall. That print there is 60 inches tall, 5 feet tall and there’s a print that’s 5 feet wide. I want drama, I want to bring people in. I want to get them excited. These metal prints help to do that. The luminesce, the color, the depth wonderful. They also happen to be very trendy right now. Things be go in cycles and there’s a joke a photographer tells me and I love this joke. He says, “You know what I’m going to display? “Framed prints. “I’m going to be the only one doing it.” And what I love about it is that’s traditionally how we think about photography but it’s become somewhat out of style. We don’t see it a lot in art shows. We saw canvas and now we’re seeing metal. Now we see prints on wood. All these different methods. One day I think that framed print is coming back. So that’s why you see metal here. Now two years ago, you saw canvas so it changes and it’s important that we keep up to date with modern trends. You need to study what’s selling. What people are interested in and you need to be a part of that movement. Ideally you want to be ahead of it. On the right side, we see some canvas. Now I love to be consistent so I would critique this a little bit. I would like to say this probably should be all metal but sometimes you have inventory, and I have canvas here. Canvas of the plulose. I love the plulose on canvas. It has such a canary feel, so I love it and I thought you know what this is a strong wall. It may not match the other two walls but on its own I really think it’s fantastic, because I have two rolling hills shot. And then I stripped it at the bottom, and that stripped kit sells really well, and it did sell at the show. But it was definitely beneficial in which display it. You’ll notice themes throughout right. The left wall is nothing but waterfalls. The right wall is the plulose. The back wall is a combination of the northern lights with some fall colors. So I’ve got two color themes, but I want people to walk into the booth. I don’t want them to go what’s that doing here? That doesn’t seem to fit. You know I do photograph wildlife but you’re not going to find an image of a polar bear in my booth, even if I love that image because it just wouldn’t necessarily make sense. So being consistent is really important. Now I got black walls, Pro panels and I love the black because it gives me a museum quality. The images themselves are hung and gallery hooks, which Pro panels sells. Next are the prints we see name tags. Those little tags are very similar to what you’d see in a museum or fine art gallery. They have a little image of what you’re seeing. Sizes with the size it’s available in the booth highlighted and a description title and where the image was taken. People can be shy and they may not be comfortable talking to you so give them a little bit of information so that they can feel comfortable and then engage. Okay now we also see in the middle of your table with the tablecloth and three small baskets of prints. It’s so crucial, I’ll talk about pricing in a little bit, but we have something in our booth that most people can afford. If you walk in and you look at the price of the metal print and you say something like $4,000, I can’t afford that. They may love your work, not everybody can afford a $4000 print but guess what on the table is something for $25. And $25 while it’s something to a lot of people if they love your work and make a connection, it is enough to get them to have that impulse buy. So we’ll talk about that more later but that’s what those baskets are doing. Behind the baskets are black bins with prints and I have it in a circular fashion so people can move through in a circular way and cover everything in the booth. It’s very important that they walk in and they come out the other side. In those black bins are larger prints, more expensive prints and they’re able to cycle through. Now storage is key. I did not allowed to store stuff outside the booth because guess what I’m surrounded by booths. So I’m using, I have a bin underneath the table and the black bins with the prints, if you lift them up, I have storage underneath so it’s very important you get creative with how you store things. We also see lighting. Okay lighting was pretty new for me and these lights were purchased at Pro panels as well. They do sell a lot of the accessories you’re going to need and they actually go through a wonderful tutorial on how to set up the lights with a portable battery. And adding that light is that little bit of magic quality. Again how do I simulate a gallery? How do I make people feel like they’re in a gallery? Lights. They’re not essential but they do give you that little bit of extra touch especially at a show that has long hours. We can do it in the morning and in the evening when the light is not as strong. And we’ll see that nice white booth that is way more expensive canopy. Nice and strong. Now there’s one thing that bothers me about this booth and that it feels a little bit cramped, 10 x 10 is not ideal. So recently I took a plunge and I invested in a 10 x 15 booth. All I had to do was get another Pro panel. That’s the beauty of expansion is that I didn’t have to buy a need booth. I was able to get two Pro panels and extend it in the middle and now the booth is longer, 50 feet but I did have to get a new tent. That’s where I got that king canopy for less than $300. Now we’re looking at this new booth. It just feels roomier and since I went to this, sales have increased pretty strongly. The ability to go in there and not feel cramped. To make the images not feel as close together as possible. In an ideal world, you’d have your own gallery and we have far more space in between these prints. This feels cramped to me in terms of how close they are but I’ve got to do it. I’ve got to get things on the walls to show people. You have to engage them as quick as you can. But by having the 10 x 15, I’m extending the space and making it more comfortable. So this is my current set up, 10 x 15 black Pro panels. Notice everything in here is on metal. Really bringing the audience in and I feel good about it. The lighting adds that extra touch. You never know what’s going to come two years from now. I think it’s important to be open and iteration to upgrading your booth. It’s as simple as this. Will this upgrade increase sales and if the answer is yes then it’s worth considering. So go to an art show, check out the booths. Look at the ones that stand out to you and use Pro panels and the canopy sites that I shared with you to help build the best booth you can. Now, there are some alternative options that I definitely want to share with you. One is renting a booth, whether it’s the entire booth or just the canopy. Now, I know, in Seattle, there’s a company that rents them for people that travel to the show, and you’ll find that in other cities as well. That is something that could make a lot of sense if you’re either traveling a long distance or it’s your first season, so consider rental. Another way to go about doing it is used. If you think about it, there’s not a lot of people that partake in art shows, so when somebody’s ready to move on, whether they’re upgrading their booth, or maybe they’re moving on to another career, or retiring, they need to sell it. But how are they going to do that? Well, most often, it’s either going to be Craigslist. Art Fair Insiders has a forum for selling their booths as well. So, you can find amazing deals. I’ve even been to art shows that I participated in where the artist has a little for sale sign on their booth, hey, they need to sell it, they need to move on with it, so you can find some great deals. So, rental and used are two excellent options. Another thing to consider is, but what if you’re not a photographer? When you’re hanging art, whether it’s photographs, paintings, anything, mixed media, to that extent, you need wall space. But there are other types of work that you may be interested in selling. For example, jewelry. I once had a jeweler come up to me and he said to me, “Oh, there’s this great show in Boston, “you have to do it.” And I looked at him and I said, wait, you want me to drive my Subaru and my five by eight trailer all the way across the country? This show would have to be amazing. And he’s like, “Oh, I didn’t think about that, “I just take two large suitcases.” So, if you do something like jewelry, where your inventory is relatively small, what a lot of them do is they’ll, they can fly around, just get on the plane, take their suitcase as their inventory, and then rent the booth when they get there, and that makes a lot of sense. So, it depends on what you’re selling what kind of booth you may need. Potters, for example. When you do pottery, a lot of times, it’s shelving, so you need really attractive shelving because your art is three-dimensional, of course, so you need to actually sit it on those shelves. So, again, the best way to research is to go to the shows themselves, find artists that do something similar to what you do, and see what works for them and what speaks to you, and then build a booth accordingly. How you price your items, is so crucial to success. Now, I really, really want to impart my knowledge here, so that you can start in a really strong place. There’s three tiers, this is the way I look at it. You have kind of a cheap tier, a middle ground, and a higher end expensive tier. I like to kind of be in the middle ground. Let me talk about that. The first tier says, “I want to have something in my booth “that is so cheap, everybody can afford it.” From a photographic perspective that equates to greeting cards or postcards, some sort of card that you have on a rack, you spin the rack, you sell ’em for $4, three for $10. It’s the idea that anybody can, ah, $4, I can afford that. You may move quite a few of those postcards or greeting cards, but the labor it takes to produce them, and the amount of money that it’s going to equate to once you add it all up, for me, I’m strongly against that, I don’t believe in that. And so, I shy away from that. But, what I like, I like something about the idea, the idea is have something people can afford, and so, that brought me to the 8 by 12 print. The 8 by 12 print is the smallest thing that I have in my booth, and I charge $25 for it. There are other photographers who say, “Wow, that’s just far too little. “You’re not valuing your work. “You need to raise your prices.” But what I’ve discovered is 25, some people think it’s 20, I go with 25, it’s the magic number of somebody coming in, seeing your art, saying, “This is beautiful. “I want to own one of these pieces. “But I didn’t come here to buy art. “I don’t have money.” That’s where the $25 piece comes in, because you’re asking somebody to spend a little bit, but to them mentally, it’s a little bit, the 20, $25 mark. Chances are, the same person would have loved to have spent $4 on a greeting card, and left, now they’re spending $25 on a small print. Your profit margin goes way up, and your work load goes way down, because it’s easier, it’s actually easier to produce the 8 by 12 print, than it is the greeting card. Less materials involved. Okay now, what goes beyond the $25? Well, this may sound a little bit salesmanship-y, but two for 40. If you’re going to spend $25 on one print, I would love to sell you two. A lot of my work looks good together. It’s themed. Here’s a beautiful Japanese maple, what about another maple to go alongside it? For another $15 you can own both, or two for 40. Now again, you may say, “Well, I don’t want to do that. “I want to not lower my prices, “or have sales, or bargains, or combinations.” But the reality is, is that I have to make a living. Now, I want to be able to continue to do what I love, but I also want to be able to make money doing it. These techniques work, they are effective. Now, let’s go beyond that. What if somebody wants something a little bit bigger? A little bit nice, something they can put on the wall that has a little bit more size to it. I do 12 by 18 prints, I charge $45 or two for 70, and I do one more size 16 by 24 prints and I charge 85, or two for 140. You can see kind of the price start to raise. You get to see the progression. I’m trying to find a comfortable place for everybody so that they can walk away with something to remember how much they loved this art. Something they can put on their home. I love the idea that somebody is going to hang this on the wall. Much the same way a jeweler is going to love to see their jewelry out on somebody. The idea is, yes I want to sell these prints, and I want to sell a lot of ’em. I’m okay selling a lot of 8 by 12 prints. It’s satisfying that you’re sharing your art, and I’m making some money. If you think about it, two for 40, if you make 10 sales, that’s $400. That’s something, that’s getting you started, that’s going in the right direction. That’s better than 100 greeting cards, right? Now, on the wall, let’s take a look at my booth here. On the wall are larger, metal pieces. These are expensive. The most affordable metal piece you see on the wall is $500. And, they range from $500 to $4,000. When you go into an art show, it’s important to have pieces, in my opinion, where somebody is coming to the show, they want a dramatic piece. They have disposable income. You need to make a compelling case that you are the artist that has the piece that’s going to move them. At this particular show, I happened to move two large pieces that you see here and it was that same circumstance. The customer came in, they loved to piece, I did everything I could to make them feel comfortable, welcoming, tell them the story about the piece, little bit back and forth, they went away, they came back and both pieces sold. If I didn’t have a dramatic expensive piece in my booth, I wouldn’t have the ability to connect with that audience. So, you can see, you’re dealing with all sorts of different income levels, different disposable incomes, some people want to spend a little bit of money on art, some people can spend a lot. I want to reach as many people as possible. Now, again, some contrary opinions. What if I had greeting cards and small pieces? That could work to build up some money, but without selling a piece for three or $4,000, it’s going to be difficult to jump your income to a level kind of above where those cheaper pieces would take you. Another thing to consider, is some photographers will only have large, expensive pieces. I’ve been in booths where there’s nothing less than $500. The goal of those photographers, in some situations, is to move three or four pieces the entire show. Some shows last up to three days. You’re looking at eight to 10 hour days, so you could be sitting there for let’s say 28 hours in a booth, conversing with an audience, trying to get them to buy your art, and you may sell three pieces. If those three pieces each sold for two to $3,000, that’s okay, that’s a good show. But, for me personally, I struggle with that, because I know only two to three people are going to have my art as opposed to maybe 50 people in the set up that I have now. There’s nothing wrong with that method, it can work if you’re at the right show, but I’ve also seen people with that strategy make zero at a show. In fact, that’s not uncommon. They’re taking that risk and for me personally, I don’t want to do that. I would rather start with a four or $500 base from small pieces, and then hope to move the big pieces along side ’em. I hope that helps guide you on how to appropriately price your pieces. archival foam core backing with paper printed image with white border looks framed but its not. cut costs but dont hurt sales. i wanna talk about keeping costs down a bit more; to talk one more time about costs and the upfront investment it takes and how to get to that point of profitability. When you’re building a booth, and building inventory in which to sell, that’s going to take an upfront investment, and it may take one, two or three seasons of art shows before you recoup that investment. So there’s a couple of things you can do, that kind of help you along that journey. On is don’t quit your day job. So, as you go to the art show world, what I was able to do is kind of ease into it, and that was fortunate, and it wasn’t until I realized I could sustain and make a profit that I moved on from my previous jobs. So that’s something to consider. You can do it part-time, okay. Also as you’re trying to make profit, think about how you can cut costs. For example, a lot of art shows have an area for artists to sleep, camping. And so, you don’t necessarily have to stay at a hotel when you travel. You can camp, so anything like that to keep the cost down, make a lot of sense. As you begin to gain profitability, it doesn’t mean those attitudes change. For example, when I’m applying for art shows, I am so incredibly strict about reading those rules, thinking about travel time, looking at reviews. Is this a show were I have a chance at achieving profitability? And if I think, no, I’m not going to spend that $40.00 application fee, ’cause remember those add up. So I think the more frugal you are as you’re building this business, the more successful that you’ll be. Part of understanding pricing your items is potential markup based on costs. Now, my small print, my 8 by 12, as we established, is $25 “pricepoint”. It’s not necessarily based on how much it cost me to make. If I were to order that same print from a lab, maybe 5 to $7. I’m trying to minimize the cost by getting the right paper, by doing it myself, by getting deals on ink, all those factors. It’s actually hard to calculate exactly how much it costs. But whether it cost me $4, $3, $2, that $25 price point is based on the mental aspect of what is an impulse buy. So, it’s not as much related. Now the more profit I make off it, that’s great, but I’m not going to change that price point. Now, when you order away for a large piece and you spend a lot of money, you need to understand how to price it and there’s a general rule that we can follow. I’m on the Bay Photo Metal Print price list site. It’s pretty intimidating, to be honest. I’m looking at a 40 x 60, which is a size I really like. It’s $509 for that Metal Print. That’s not the true cost. I have to put a float hanger behind it, I have to order a wooden crate, a large wooden crate, for them to ship to me via freight. So my actual cost is going to be more like, say $750. That is a lot of money. If I were to charge $1000 for that print and make a profit of $250, you could say, wow that’s a nice little profit. But it isn’t, because the upfront cost, you’re going to have to spend that money to build your inventory. We need to make a significant amount for it to be worth our while. So, here’s the general rule. If it costs you $750 to produce that print, I want you to double that. That’s $1,500. That’s what we call the wholesale price. If a gallery wants to represent you and they say, we want that in our gallery and we’re going to go ahead and purchase that from you and sell it ourselves, that’s the price they’re going to purchase it from you at, $1,500. They will then double that and sell it for 3000. So, they’re going to make a nice $1,500 profit but you made your $750 profit and they did all the work selling it and hosting it. So, what should the price of your piece be? $3,000, exactly the same. You do not want somebody to come into your booth, see a metal piece, priced at 2,000, have them walk across the street, oh, they’re in a gallery, or how much is it, 3000. Oh, how much is it at this weekend at this particular fair? Oh, now it’s $1,500. We want to be consistent. So, wherever your metal piece is, we want to have the same price. So again, double the price as your wholesale. Double that, that’s your retail. So, that’s kind of your baseline okay? So, it’s a simple rule to follow for those larger pieces. In a perfect world, the photography, or whatever art that you’re selling at the show would sell itself. People would come in, a piece would speak to them, maybe ask a question or two, and purchase it. But it’s just not that simple. You are the artist, you are the creator. Any art show that’s higher end requires the artist be there for the entirety of the show and the reason for that is a direct connection to the audience. And as the audience comes in, they want to know who created this piece, they want to feel comfortable, they want to be able to get a background, a story. And so your personality and the vibe that you give the customer is essential to success. What often happens during a three-day show, a long season of art shows is the actual artist becomes tired or fatigued, and if you see somebody sitting in a chair slumped over, playing on a smartphone, they’re not going to do well, they just aren’t, because the customer is turned off by this. I had a season where I did one show, one show only. I was busy the whole summer, I could only do one, and I said, listen, this is a three-day show, I’m only doing one show. For three days, I am going to stand up, I’m going to smile, I’m going to greet all the customers, and I’m going to sell, and I had the best show of my career. It really does matter, so let’s talk about a couple things that you can do. First, your appearance. I’ve experimented with dressing casual, dressing nice, and what I’ve learned is it’s really about just being you. When I’m most comfortable in my clothes is when I tend to sell the best. So, during a summer show, warm weather, it’s not uncommon that I would wear, sometimes, even flip flops, or, most often, runners, because you’re on your feet a lot. I wear a pair of shorts and then I’ll wear kind of an outdoor shirt. I like to wear shirts that say Seattle and have a mountain or something that reflects, you know, it’s a lot about who I am. I love my city and I love the outdoors. Something very simple, just a T-shirt, I don’t have to dress up, and it makes me feel natural. My appearance, sometimes I have a beard, sometimes I don’t. But I tend to try and be somewhat, I don’t know, a little bit not like I just got out of bed. So, it’s just that I made an effort, I’m here. So, you want to look comfortable and welcoming. You don’t have to wear a suit, you don’t have to do that. And it also depends on your art. How does your appearance reflect what you do? If you’re a jeweler, obviously, you want to highlight some of the pieces on yourself. Alright, so your appearance is one. Number two is your body language. What often happens is you get tired, it’s hard to stand up, and you want a chair. Now, I use a Hollywood director’s chair. So, it’s a pretty tall chair, so you’re not low to the ground. And you want to try and sit up straight, and, whenever I can, I’m standing. You want to have good posture and you want to just be open and available. I do recommend saying hi, but you don’t necessarily want to bombard people with a lot of questions. So, I just, hi, how’s it going, just a brief kind of intro, and then let them explore, let them wander. Sometimes you’ll see an opening to talk, but, most often, once you’ve greeted them and we’re friendly, or even smiled, they’ll be able to approach you and say, “hey, what is this piece about?” So, just a smile, a casual greeting, nice posture, be open. If you’re distracted, if you’re reading a book or looking at a phone, they’re not going to ask you a question, because they feel like they’re interrupting you. And they’re also going to be a little bit angry, thinking, “hey, wait a second, I thought you were supposed to “be here selling me something.” So, put those books and those phones away. I know it can be boring at times at art shows, but you have to be attentive, because the sales matter, of course. Okay, now, the customers come in and you start to engage them. Most often, customers or people that come into your booth who engage you will not purchase something. That’s just how it goes. If you have an audience of 100,000 people, you’re not going to make 100,000 sales, it’s just not going to happen. Now, what people want to do is they want to give you something, because you’ve made all this effort, you have this beautiful art, you’re engaging them, and what they want to give you, if it’s not money, is a compliment. And, so, the most common thing you’ll hear is, “wow, your work is beautiful, “I love this, this is amazing. “Wow, you’re a great artist.” These are all compliments. Now, they can be flattering at first, but you will get used to them. And it’s not that they’re not genuine, I’m not saying that, they can be. But it gives the customer kind of a payment. Like “I’m not going to buy anything, “but I’m going to pay you with this.” And, so, now, this is a difficult sales technique, but I want to teach it to you. Don’t say thank you. And the reason you don’t say thank you is because when you say thank you, it says to them, “oh, I’ve paid my debt, I’ve done my thing, “I’ve given them a compliment, they’ve accepted it”, and they leave. Okay, so what should you do? “This is beautiful work, I love this piece, oh wow.” Oh, well, I took it here, this is what happened when I took it. Oh, this piece is available in different sizes. Do you like paper, metal? So you engage in a followup question with the idea of leading towards a sale, so you don’t let them off easy. Now, this is difficult, I know. If you came and observed me at an art show, I say thank you way too much, it just feels natural. But I am telling you, as a sales technique, you want to be able to not let that customer just have the satisfaction of a compliment, because, ultimately, you’re trying to make a sale. Speaking of sales, let’s talk about some ideas on how to close them. It’s possible to have a good art show selling some of your smaller priced items, so my $25 prints, or two for 40. It could be an okay show if I move a lot of those, maybe a couple larger prints. But, if want to have a great show, I have to sell big pieces off the wall. If I can sell two, three, four, now we’re going to put together a really nice show. Let’s talk about a couple ideas on how to close that sale. Customer comes in, they’re interested, and you start to engage them, nice conversations going back and forth, and you’ll run into some obstacles and I want to give you a couple ideas on how to kind of overcome them. The first one is, “Wow that piece is beautiful. “I think it would look great in my home. “I don’t know if it fits right. “I don’t know if the space is large enough, “or if this piece might be overpowering. “I’m just not sure if it fits the space.” Follow up. “I’ll tell you what, why don’t take it? “You can purchase it, bring it home. “If it doesn’t fit your space perfectly, “you bring it back to me, “refund you the money straight away. “You have nothing to lose.” Think about it from your point of view. They take it home, they purchase, it’s done. They’re going to have to make quite a bit of effort to go home, hang it, and be like, “It’s not quite right.” Spend that effort to come back to then do the return. Chances are, it’s going to fit that space, but it’s worth the risk. The fact that you’re willing to go that extra mile for them, they will notice. Now, what if that piece is kind of star showcase of your booth, and you don’t have another one in your inventory? You don’t want them to take it home, and have that big empty space on your wall. Another option, “I’ll tell you what. “After the shows over, I can come by your place, “we can hang it, take a look, “you let me know what you think.” The ability to actually deliver the piece, to be able to go to their home, is another sign that you care, and you’re willing to go that extra mile. Think about ways in which you can take whatever obstacle they give you, and overcome it, and so, that extra effort really is noticed. Now, another thing that may happen, and especially with higher priced items, “Wow, I love this piece, “but it’s a little bit out of my budget.” This is a big decision here. You can go a couple ways. You could say, “I work hard to create these images. “They do cost a lot of money in travel. “Unfortunately, this is the price “and I can’t move from there.” If you go that route, chances are, I think it’s going to be a little bit hard to make that sale because they’re basically saying, “Hey, I’m almost there, I’m interested, “I just need a little something from you.” You have to make that decision. I can’t make it for you, but what I do personally, is I say, “Listen, this is an excellent price, “but, I’d be interested to see what you think. “Would you like to make an offer on it?” I open the door for a little bit of bargaining. Let’s talk about our profit margin again. We mentioned that price point of 750, the wholesale price would be 1,500, and I’m selling it for 3,000. If I’m selling it for 3,000, and I’m working with a buyer, and essentially I decide I’m going to part with it for 2,500, they feel like they’re getting a nice deal. Think about your profit margin from 750 to 2,500. That’s much better than saying, “Nope, that’s the price.” And having them potentially walk away. In a perfect world, I’d love to have a system where everything was priced perfectly and people just came in and spent exactly what they saw. But, there’s something about art shows, the fact that you’re not in a physical gallery space, but that you’re in this market, that gives people the notion that bargaining is okay. For better or worse, that’s just what ends up happening. What I do, is I embrace it, and I use it to my advantage. If somebody wants a deal, and I’m able to just make them feel like they got a good deal, then I’m able to push a sale and I might be able to move a piece that maybe my competitor didn’t. I do want you to consider that, because it can be a very powerful tool. All right so, just to review, they create an obstacle, you create a way around it, and think about the power of bargaining. Let’s discuss some practical matters, like payment. Now you want to offer as many payment options as possible, and there’s three major ones: cash, cheque, and credit card. Let’s deal with cash first. If they want to pay in cash, this is great news for you because you don’t pay credit card processing fees. So it’s wonderful. But if your item is sold for let’s say, $25, most places require you to charge tax. So your total might be something like $27.38. So, I keep on hand with me, basically a jar full of pennies, and dimes, and nickels; just change, right. Loose change for those odd numbers. I also carry plenty of ones, fives, 10s, 20s so that if somebody wants to buy something that’s $25 and they pull out a $100 bill, it’s no problem making change. You don’t want to be in a situation where you say, oh, I can’t break that hundred. It’s very frustrating. People have the expectation they can pay with currency and you can provide the change. So, cash sales, a little bit finicky with dealing with that, but it’s to your benefit because you’re not going to pay fees. Next one is cheque. Cheques are rare. You don’t see them as much as you used to, but it’s the same thing with no fees. When I do a cheque or accept a cheque, I like to see the license of the person writing the cheque, and I make sure the name and the address matches. Just a little bit of security for myself there. So I will accept cheques. What’s wonderful too, is as soon as I get the cheque, I can use my app on my phone and deposit the cheque immediately. So I typically will do that right away. Now the third method is credit cards, and the most common method that you will see. Technology sometimes is a wonderful thing, and here, absolutely. It used to be you had these big credit card machines, you had to dial up, and it was just a real pain, it was temperamental. You had to pay quite a lot in fees in terms, not only of credit cards fees, but actually rental of the machine. That is all changed. And now your smartphone; no matter who makes it, has an option for you to be able to accept payment. Now I’m going to share with you a couple companies that do it. Kind of the most established ones. The first one’s a company called Square. And Square, if we look on their page, has this little tiny dongle that goes into your headphone jack, and once you put it in your headphone jack, you can slide a credit card. It works fantastic. Your customer then, will do a signature with their fingerprint right across, and then you can email the receipt instantly. So, it really couldn’t be much easier. What Square will do once you set up an account, is they’ll collect all your payments for the day, and at the end of the day, they’ll send it to your bank account. Instantly. You don’t have to do a thing. Another one to consider is PayPal, competitor of Square, they also have that same little dongle that plugs in, and you slide it and you go from there. When you’re investigating which one to use, you’re going to look at the fees, potential fees. Whether it’s 2.75 or 3%, you want something with low fees. Are there additional costs, is the reader free, does it cost any money to get the transfer back to your bank account? Those kind of things. But I’ve used both Square and PayPal, and they both work excellent. Now, little tip here: your phone then becomes essentially, the bank. That is where the (mumbles) is taking place. If the battery on your phone runs out, you’re in serious trouble. A lot of times at art shows, there’s no place to plug in. So, consider either something like an external battery case, that the battery is actually built in to the case, or you could bring a portable battery charger. They’re very affordable nowadays. You can get one for $20. Plug it into your phone, make sure you have plenty of juice. If you’re doing a lot of sales, and it’s a 10 hour day, your battery is going to run down. All right, so make sure you can accept cash, cheque, and credit card. You’re never going to lose a customer because you can’t accept their preferred payment. One more practical thing to consider is packaging your goods once you sell them. Now, it depends on what it is that you’re selling, of course. Jewelry, a lot of times, you have a little pouch or a little box. But, for me, as oftentimes I’m selling a print that’s 16×24 on a 20×28 foam core backing, so they can be quite large. I use a company called Uline 800-295-5510. They do office supplies in bulk, and so you’re able to get quite a deal on bags. Now, I use these poly bags, and they’re clear. What’s nice about them is, when somebody purchases a print and I put it in the bag, and they walk around the show, guess what, everybody can see that print. And I want people to know that I’m selling things, and that you want to be a part of that, you want to, oh, that’s a beautiful print, where’d they get that? So, I like the transparency. But it is plastic and we have been moving to paper and some cities require paper bags, so check with your show coordinators to see what you’re allowed to do. Another item I absolutely love, and I mentioned this already, but the GalleryPouch, oh, it’s so fantastic. So, it’s basically bubble wrap that goes to any size you want. You can custom order these. And so anytime you sell something off the wall, so, for me, I’ve been doing metal pieces of late, I always have a bubble wrap GalleryPouch. And I’m able to put it in and give it to the customer, and the customer knows, as they take it, this is going to safely be transported to my home. How else are they going to wrap it successfully? And so the GalleryPouch is really a fantastic tool. So it not only works for photography, it works for painting, basically any 2D media, it works wonderful, so I really recommend the GalleryPouch. Now, another cool thing is something called drop shipping. What often happens is somebody comes in and says, “I would love that piece”, and I think, oh, that’s amazing, they’re going to buy this large piece. But that piece is the showcase of that wall. If I lose that piece off that wall, it’ll hurt potential future sales. So, I’ll tell them, wonderful, I’m going to make you a brand new one and sent it to you, okay? And what that does is it gives you the ability to continue to sell more of that large piece while making a sale. Now, most printing labs will do something called drop shipping. So, I’m here on Bay Photo, a lab I like to use, and if I go to the drop ship section, it says, “we can drop ship directly to your customers “in white label packaging.” White label packaging is generic. No invoices, or anything that identifies Bay Photo as the producer of the prints. So, basically what it means is that when you drop ship to a customer, it basically is coming from you. So, Bay Photo is making the print, but it’s coming from you. And that’s a good customer relation. You don’t want people receiving products that are from a third-party. So, most labs do this and I recommend looking into drop shipping. So, a couple different bag options and as well as a way to ship it as professional as possible. All right, let’s go back to talking about the big picture. Art shows, in general, and trying to impart more ideas to increase your success. Now, I cannot understate the mental grind that takes place as you’re working in the art show circuit. Until you’ve done it, you really can’t understand. It’s four hours of hard labor setting up the booth, and then it’s eight hour days, ten hour days, a lot of it in heat, sitting, just trying to make a sale. And what’s really tough mentally is if nobody’s purchasing anything, you’re not making any money. There’s no guarantees that you’ll sell one, single item. And so mentally, you start to beat yourself up a little bit. You start to say, oh my goodness, is anybody going to buy anything? I haven’t sold anything for two hours. And so I notice a lot of people that work shows, in fact, I’d say almost everybody I’ve met that works shows, goes through these mental blocks during a show. Also keeo working while youre at your stand… What i mean is I PAINT at my booth to attract people to my BOOTH… so Im making a new painting while waiting for people to BUY. I have attracted news press and judges to my booth this way. Otherwise what happens is, you see it on their face, you see it in the way they act. And I really want to impart with you the idea that mentally you have to be tough to do this; you just do. And you have to believe in yourself, believe in your ability to sell, and know that even if there’s one hour left on a three day art show, and you’re a thousand dollars under your goal, you’re going to make it, and that next customer that walks in, you are going to sell them a thousand dollar piece, a $2,000 piece, and go a thousand dollars above your goal. I know it’s tough, but that is the attitude that leads towards success. So your mental fortitude is huge. One way to improve that, I think, is to create an ideal circuit. This is what I mean. If your first year you do let’s say five shows, test the waters. Maybe three of the five work really well, two not so well, maybe the next year you get rid of those two. But you realize, I think I can do this. I really want to go for it. So then you do 10 shows, and again, you’re learning each time which ones work, which ones don’t. And maybe after a couple years you find 12 shows that are great. That becomes your circuit. This is what I do; I do these 12 shows. Maybe once in a while you throw in a new one, but you start to establish a pattern, and I think that helps you mentally prepare. If you have five new shows that year, it becomes kind of daunting. So create a system of shows that work for you, they’re profitable and you need to find the number. Now some people do 30 shows. To be honest, I wouldn’t be able to do that. That would be too much of a grind for my personality. So you have to find out what works for you, okay? So don’t overdo it; don’t do more shows than you can handle. The attitude that you portray in that booth is huge. So it’s really about handling the grind. So create a circuit of shows that are profitable, and the number of shows should be comfortable so that you’re mentally tough throughout. Let’s talk about your customer base. We need to develop repeat customers. If I were to attribute one quality of what I’ve been able to achieve as a photographer as leading to a successful career, it’s been repeat business. How do we do that? First and foremost, we want a way to communicate with people, so it’s very important that you have a guestbook where people can sign their name and add their email address. When you do that, you can add them to a newsletter and you can stay in touch with them, let them know what other services you provide, let them know what other art shows you’ll be doing. So, you want to establish that relationship. Another thing you can do is consider that everybody that walks into your booth has the potential to do business, not only on that very moment, but down the road as well. Let me give you an example. Let’s say you go to a city to do an art show that you’ve never done before. Somebody walks into your booth. You have a good relationship, you’re smiling, you answer some questions, they end up buying two prints for $40, good sale. You don’t think about them again, you’re happy about the sale. That show goes really well for you. You go the next year. Guess who’s coming back? People tend to find art shows in their own communities that they believe in and support and go every single year. I can’t tell you how many times I run into the same people over and over again. Now, they come into your booth and they say to you, man, those two prints are beautiful, they’re hanging in my wall, thank you so much. You say, oh, it’s so great to see you again, I’ve some new pieces I’d like to show you. And that leads to another sale. And because you’ve established this relationship, they become comfortable with you and they want to support you even more. So, now it’s time to step up and buy a larger piece. So, if you understand this, if you understand that everybody who walks into your booth, not only can you make a sale at that moment, but you can do it each and every time you see them, that is huge. But, also, consider other services. Now, mine main source of income is teaching. I lead workshops around the world and in order to tell people about that, you need an audience. And what I did at art shows is I said, hey, see these great pictures here that I made? Well, I hope you think they’re great, you’re here enjoying them. I can help you make images similar. I can take you to these locations and I can help you create your own art. And, so, building that relationship with people for services other than just selling art was a great way for me to connect. So, build your customer base by gathering information, names and email addresses, and treating people with respect and the idea that they’re going to come back and see you again. The most important piece of advice I can give you is to study and evolve. Let me explain by giving an example. As a landscape photographer what I did was travel the world trying to create beautiful images of landscapes. That’s what I did. And in doing so often times you would take photos of icons. Maybe Mesa Arch in Canyonlands, or the Watchman in Zion. And I have an example on my screen here of Mount Rainier. Now, Mount Rainier is my local mountain. It is a dramatic beautiful mountain. And it gets the most incredible alpine meadow wild flowers that I’ve ever seen. But every season it’s different. Not only that, but to get a good sunset on the mountain takes a lot of patience. So it took me years and years to make this particular image. And as I look at this image it makes me very proud, because of how long it took me to make it. All that said, it doesn’t mean it’s going to sell. It doesn’t mean that translates into somebody that I’ve never met walking up to my booth and say, “I want that picture, “I know how hard it is to take that picture”. Let me tell you what a lot of them are thinking. A lot of them are thinking, “Oh, that’s Mount Rainier, I know that”. “Oh, that a sunset, yeah I see those all the time”. There’s nothing about this photo that is captivating in a way that makes them go, “I’d never seen anything like that”. Or, it doesn’t necessarily make them think of art, it makes them think of a place. And this is something that, once I’d learned, my sales went considerably higher. Let me get into further detail about what it means. When somebody looks at this piece and they talk about Mount Rainier, or if they ask a question and they say to me, “Where was this taken?” As soon as you get into that dialog it’s about a place. It’s about a photo of a place, not about, “This is a piece of art, “that would look good in my living room”. There’s a disconnect there. And it’s very important to understand that. I can sell this piece, and most often had sold to people, who had a personal connection to Mount Rainier. They’ve summited Mount Rainier, they spent their childhood going there every summer, there’s a personal connection. There’s not a lot of people like that, but there’s certainly are some. So it’s not that this picture can’t sell, but the problem with it is, it’s a sunrise, colorful, mountain, wild flowers, it’s a little bit generic, and it reminds people of a place instead of them thinking, “This is a piece of art”. Let me show you another image from the state of Washington. This image is called Velvet Hills, it was taken in the Palouse in Eastern Washington. It’s very difficult to know where this was taken unless you’ve spent time there. It’s very difficult to understand why you’re seeing golds, greens, purples and yellows. You don’t think of purples existing in that way. These colors are very natural, it has to do with the way the sun’s striking it, and the picture taken just at the right time. When people look at this image they’re thinking about color, they’re thinking about patterns, they’re thinking about light, and they’re thinking about where they want to hang it in their home. They’re not thinking about, “Oh, that reminds me of this place”, or, “Where was this taken?” And so, that may come up in conversation, ’cause they may want a story to tell people, who come in their home. But I’m telling you, the first thing in their mind is, “Wow, those colors are beautiful, “that would look really nice in this room”. And that was such a revelation for me to understand that. And this is what I’m talking about, study your customers and evolve, change. Let me show you one more example. This is a place called Convict Lake, this is in the state of California, it’s a beautiful lake. This image was taken after a fresh snowfall with a beautiful sunrise. As a landscape photographer I’m so proud of this image, it’s beautiful. I would never try and sell this at an art show, because I don’t think it would sell. Unless I was in a neighboring… Maybe I did an art show in Mammoth, maybe, because there’d be a connection, more of a local connection. But selling this in Seattle, there’s very little chance. Because it’s a sunrise mountain shot, it’s a little bit generic, and people are going to go, “Oh, that’s pretty, where was that taken?” And it will end there. Now, there’s an image I took, very close to Convict Lake, I took this at Lake Tahoe, this is the very last snow on fallen aspen leaves. And the color of the leaves, the drops, the second I took this image I knew, this was going to sell. Because it is about color, it is about those beautiful rain drops. It doesn’t matter where this was taken, it’s irrelevant. It’s about how beautiful it is. It makes people feel. It’s just a wonderful artistic representation. So as an artist I loved making it, but I also knew that because it was about the colors that I was going to be able to sell it. And this is definitely… It turned out to be true, this was one of the best-sellers that I’ve ever made. And so with that in mind, it’s about selling work that the audience is interested in buying. It’s not about selling work that necessarily is your favorite, that wins awards, that cost a lot of money for you to make. Another story that I find interesting, I have a friend who worked the art show circuit, and he had a rule, “I’m only going to take photographs, “that are within a 100 mile radius of where I live. “And I’m going to accomplish two things, “The first, I’m going to keep my cost down.” Virtually no travel cost involved. “Number two, I’m going to do art shows “in that same 100 miles circuit. “So that everybody comes to the booth “there’s a personal connection to those locations. “I’m not going to take this art and travel two states away, “because they’ll be no relationship”. That was his strategy. And I watched him make a lot of sales at a show. And I said, “Wow, that is brilliant”. If you really thought about it it made a lot of sense. And I realized something, if I spent thousands and thousands of dollars, and I traveled halfway around the world, I climbed a mountain, and I waited there for two weeks for the ultimate sunrise, because I wanted a perfect mountain shot in the Himalayas, and I brought that home, and I put it on a wall, mentally I think, “Oh, my goodness, “this shot’s going to sell like gangbusters, “the amount of money and effort it took to make this shot “everybody’s going to appreciate it”. The reality is, nobody will. Because unless they’d climbed that same mountain, they’re not interested. What they’re looking for is something beautiful. Something colorful, something that matches a particular wall or a space in their house. And once you understand that you will be able to streamline what you’re selling and lead to a great deal of success. As an artist, being able to sell the work that you produce, the pride, I mean, this is what you do, what you love to make, you create, and to be able to sell that to an audience is incredibly fulfilling and satisfying, but it’s also very intimidating. And what I’m hoping is, throughout this course, you have the tools to get started. Because, essentially, if you want to sell your work, you need to go where people are buying. And so I know it’s a big step, it’s a big investment, but that’s the best way to do it. Now, I also want you to have a really nice website. The idea of being able to sell online is wonderful. Some people are very good at it. But it’s challenging. It’s challenging because people can’t see it, they can’t touch it, they don’t know how well it’s printed, so it is a challenge, but I still want you to have that website. Being in-person, having a portable gallery, an audience of 50, 100,000 people coming to you, creating that relationship, it’s really a special thing. The websites that I introduced earlier, like Art Fair Calendar, Art Fair Insiders, Zapplication. If you go into those websites, deep dive, click on the links, click on the forums, read, the more research that you do upfront, the more likely success you’re going to have. And when you’re ready to start, I would recommend a slow start. Try a few shows, see how you feel. Are you up for the mental grind? Once you get a few shows under your belt, then you’re going to know, and if you’re ready, then you can really dive in. And I hope to see you out in the art show circuit.